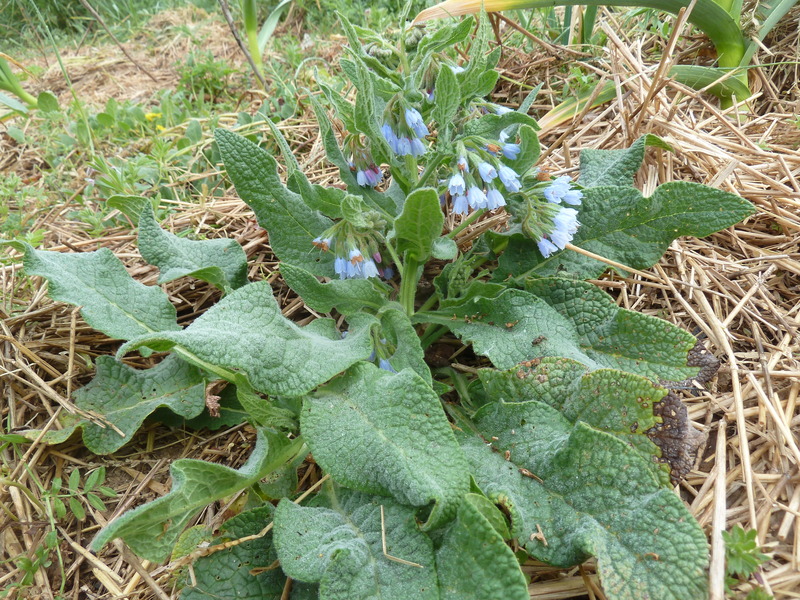 Comfrey is a low growing, bushy and very hardy ground cover especially useful in food forest gardens because it is a dynamic accumulator. It also comes highly recommended as a companion plant for fruit trees. Hidcote is a compact form with silvery-green foliage and blue flowers. Height and spread is 1’-1.5’, and hardy in zones 4-8. All Symphytum are very excited about cell proliferation which makes them very easy to grow. Make sure that you plant them where you want lots of them because Comfrey will spread around quite a bit and make itself comfortable. Permaculturists like Symphytum ‘Hidcote Blue’ because as a ground cover it is dense and out competes other rapidly growing wild plants in the garden and it attracts bees, hummingbirds and other pollinators with its delightful blue flowers. It is also a dynamic accumulator, beneficial insect habitat, vital compost tea ingredient, nutritious and quickly composting top mulch.